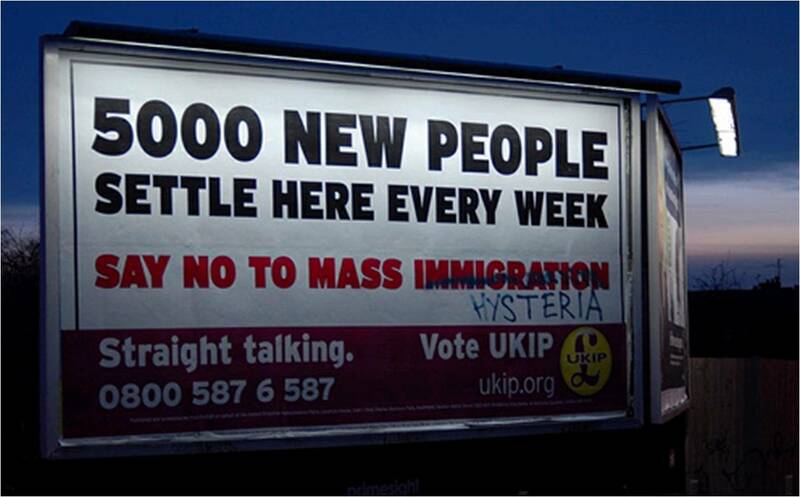 The new UKIP poster about immigration has come under some fairly severe criticism. Many online commentators have labelled it racist, whilst others have taken more direct action (above). Racist? I suppose the only way to not be racist then would be to let as many people flood into the country as possible and drain our resources (e.g. 50% of new houses are now sold to immigrants, you don’t even have to be of Green voting stupidity to work out what that does to house prices). No. 5000 immigrants is not a race. It is to do with numbers and society. Having a strict immigration policy isn’t even left or right wing, it is to do with common sense (typically found more wherever career politicians are absent). I don’t no how on Earth anybody can suggest that poster is Racist. We need to deal with mass immigration before we have no space in this country. UKIP IS racist. Mass immigration does indeed need to be dealt with, but UKIP’s leaders, members and activists tend to be far-right (often ex-bnp/edl/nf/NBP) racist morons. Membership is not available to anyone who is or has previously been a member of the British National Party, National Front, British Freedom Party, British People’s Party, English Defence League, Britain First or the UK First Party. Any applications made from people who are or have been members of these organisations will be refused, and any subscriptions collected will be refunded. By applying for membership you certify that you are not and have never been a member of either of these parties. There is nothing racist about this poster, it is a fact and this needs to be stopped and for our children to be given a fairer chance to housed in years to come.